Part of my plan for raising bilingual children has always included teaching them how to read and write in Spanish. I find it very discouraging that so few elementary schools offer foreign language education. It is shocking considering all of the recent studies that demonstrate the cognitive benefits of being bilingual. To make up for this shortfall in the public education system, my sons will have Spanish classes with me at home. I am doing some part time home schooling to make up for this major deficit in their education. While I am a Spanish teacher, I was trained and credentialed for the high school level. Teaching my children how to read and write in Spanish has required me to learn some new methods and strategies. I was not in any hurry to teach my son how to read, but rather followed my child’s lead. When he started to ask me what signs said and began to sound out words on his own, I knew he was both interested and ready to learn. I had planned to stock up on books and materials for teaching my children prior to visiting Peru and visited the Coquito store. Much to my surprise Mr. Everardo Zapata passed through the store on the way to his office. I was amazed! Even though he is now in his eighties, he still goes to work everyday improving upon Coquito and its teaching materials. 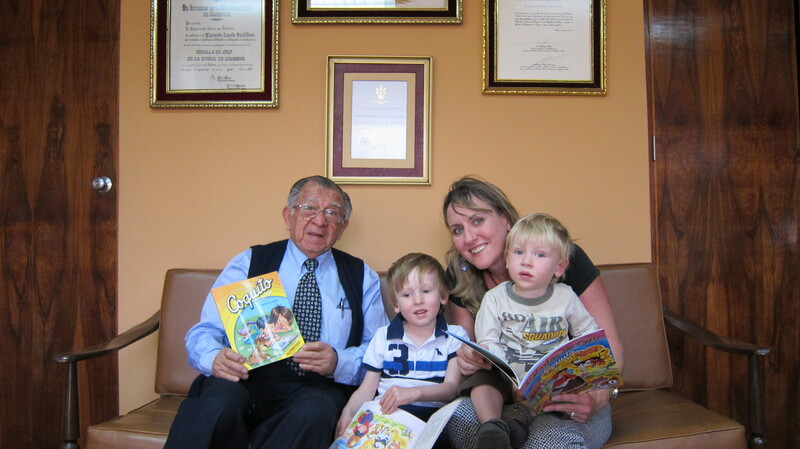 I made an appointment to return the next day and was thrilled to be able to actually meet the man who created this wonderful method that has helped generations of children learn how to read. He was very kind and welcoming, explaining how to use the books that we purchased and even giving me books to bring back to the United States. Now that I have been using the Coquito books and posters with my son, I am amazed at how easy it is to teach him Spanish using this process. My son loves to learn and actually calls our reading sessions “playing Coquito.” It is so easy for him to sound out words and string together sentences. The whole teaching and learning process has been a rewarding and fun experience, and I am fortunate to have discovered one of the best methods to help him achieve success. *I am not an expert on the method of teaching using Coquito, but I have found it fairly straight forward and easy to use. You can also check out these two YouTube videos about the history of Coquito and its creator Everardo Zapata Santillana. Coquito Clasico can also be purchased on amazon.com through La Tiendita. How exciting! I actually have a couple of Coquito books, bought in Peru, that I have not yet made use of. Now would be the perfect time to start using them! Thanks for the info. are they sold in the u.s? what age level do they begin? 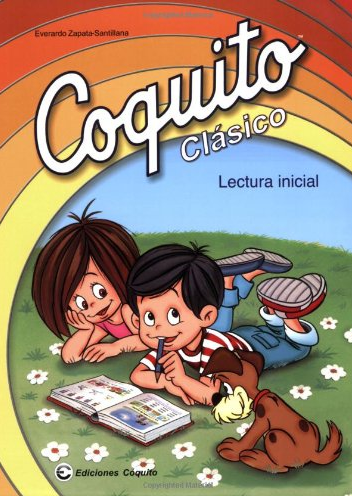 The Coquito Clasico which you can purchase on-line is for teaching reading. I am using it with my son who is 4 right now. Unfortunately, the other books are only in Peru. We learn with coquito, and our kids too. My son, who is now 45, sent me this information. It brought a lot of memories. I taught my son and my daughter to read in Spanish with Coquito. Although I only use tthat book, which I bought in Colombia, my children learned to read in Spanish very well. I used it when they were three and four years old. It was a great asset for them when they went to school and learned to read in English. I used the same book with my granddaughter before she started kindergarden Tomorrow she will turn seven, but she still remembers her Coquito with the same love my children do. I was so happy to learn that the creator is still with us. I want to send him my most sincere admiration and give him thanks for giving us great memories about learning to read and write in Spanish.